Leanne Coffman has worked since 2004 as a writer, consultant and expert witness for litigation. She facilitates training programs for management and staff of international hospitals and national companies in physical and technical security, emergency procedures, disaster response, workplace and fire safety and OSHA/HSE compliance. Coffman is a licensed training provider for the American Red Cross and Subject Matter Expert for multiple sources. When your toddler wakes up with crusty, draining or red, irritated eyes -- or what is commonly called a “cold” in her eyes -- it can be very distressing for the child, as well as for parents. These symptoms, however disturbing in appearance, are frequent occurrences in youngsters. Always check with your physician when a toddler has cold-like eye symptoms, as many conditions warrant an exam for diagnosis. If she’s fever-free and both eyes are itchy, watery or red, it’s possible your child has allergies -- especially if she also has a clear runny nose or is sneezing. Chronic sinusitis, most often caused by allergies, affects nearly 35 million people in the United States, according to statistics from the National Institute of Allergy and Infectious Diseases. Cool moist compresses and antihistamines can offer some relief. Talk to your doctor about toddler-safe medications and discuss allergy tests if symptoms are chronic. Tenderness, swelling or redness of the eyelid can be caused by an infection in the oil-producing sebaceous or sweat glands in the eyelid, which produces a stye, according to the Children’s Hospital Boston. Try to keep your child from touching her infected eye and help her wash hands often. Regular applications of warm compresses may be soothing. Your medical provider may prescribe antibiotic ointment to keep infection from spreading and should examine her to make a positive diagnosis. Greenish eye drainage that occurs during a cold might be due to a sinus infection -- especially if accompanied by fever, congestion or sinus pain, according to Ask Dr. Sears. Wash the drainage with warm damp cloths and give fever-reducing medications approved for toddlers to lower temperature. Greenish eye discharge especially with any combination of these symptoms means a doctor’s appointment is necessary. Yellowish green drainage and a red eye that has not occurred with a cold is most often caused by bacterial conjunctivitis, which usually begins in one eye but can spread quickly to both eyes. 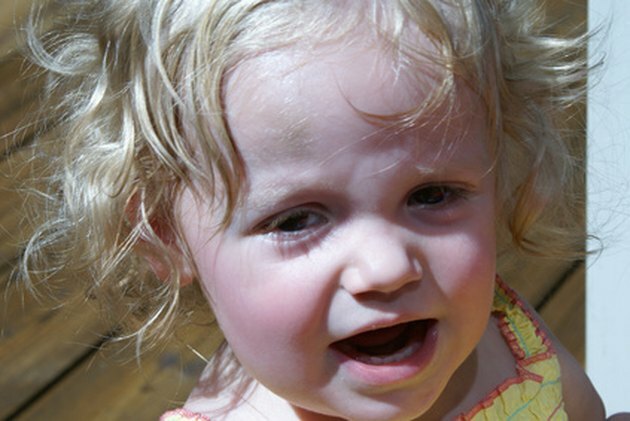 Your toddler's eyes might also be light sensitive and itch or burn. Sterile gauze moistened with warm water can be used to clean matted eyes and then discarded to minimize germs. Head to your physician, as the usual course of treatment is antibiotics and watch for other symptoms such as ear pain, which indicates worsening infection. Conjunctivitis can also be caused by a virus that often causes similar itching and red irritated eyes, but the discharge is usually white or clear and often starts in one eye. Upper respiratory symptoms can be present. Clean eyes as with bacterial conjunctivitis using moistened disposable gauze. Viral conjunctivitis is not usually treated with an antibiotic. However, only a medical practitioner can make a certain diagnosis, so your child must be examined. “Red flags that signal the need for immediate medical attention include changes in vision, vision loss or eye pain,” says Dr. Stevenson. These symptoms may indicate trauma to the eye, the presence of a foreign object or more serious conditions which require emergency treatment to prevent vision loss.